Junk and Rubbish Removal Services in South Carolina. At 1844-Junk-Rat – junk and rubbish removal in South Carolina is made easy… because we do all of the work! If you are like so many home owners and small office owners, ordering new furniture means you have to get rid of the old ones. In South Carolina, 1844-Junk-Rat.com can take the stress out of getting rid of your unwanted items all at an affordable rate. Instead of trying to sell them online, or at a yard sale, let us take care of the heavy lifting for you. We are dedicated to being eco-friendly and community minded so we donate useable items to local charities, while recycling the rest before heading to the dump. Old refrigerators, mattresses, couches or even piles of trash are no problem for our professional haulers. They are happy to take care of all the work so you can spend your time taking care of your space. 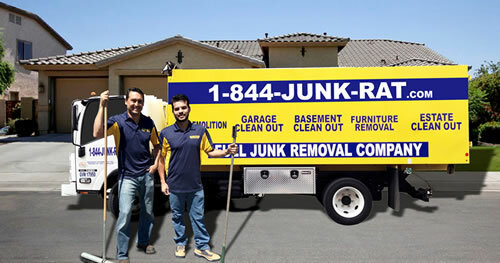 Setting up an appointment is as easy as calling us at 1844-Junk-Rat.com and letting us know when would work for you. A flooded basement is never fun, and it’s even worse when you end up with stinking carpet or rotted wood. Well, that’s exactly what we had to deal with so instead of shaking our heads in exasperation, we called 1844junkrat.com/ for their Flood Basement Clean Up package. Those boys were great, they let us take a breather by handling the pulling up and hauling of the soggy carpet, plus picked up all the other junk that was damaged in the stagnant basement water. I didn’t hear ne complaint; in fact, I saw nothing but smiles and received very good treatment from the guys that came to help us out. They left the basement much cleaner than we could have ever done ourselves, all without charging extra! As always, we got excellent hauling from 1844junkrat.com/ and good customer service too. They handled our Flood Basement Clean Up with complete care and efficiency. Pricing? Totally affordable, surprisingly so in fact!